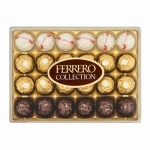 Ferrero Rocher, Pack of 24 pcs Ferrero Rocher 3 different flavors, box each balls filled Chocolates. Perfect for celebrating special moments of life. Our Cut off time is 2pm local time for same day delivery and next day to province. Order received after 2pm will be delivered on the next day. Our shipping charge is $4.99. Someday delivery is not applicable during any special occasion like Valentines Day, Christmas, Mothers day and Father Day. Item may be slightly vary depends on the availability of the item. However over the Brand and quality remain same.